Happy Weekend! I've been so busy making card sets this past week ... and really lazy about getting my camera out to take photos. I promise to get caught up with photos soon. In addition, I'm helping my daughter prepare for an art show in San Francisco. She'll be showing her street art photographs. Today I just had to take a break and make a "regular" card. I used Freshly Made Sketches #35; another great sketch! 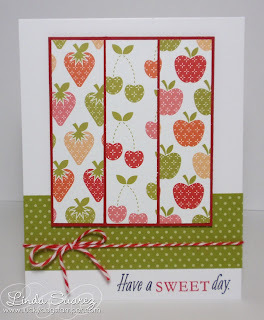 I am into anything fruit-related now so, of course, this card had to incorporate some cute fruit patterned paper from Papertrey Ink - cute name too - Fruitti Tutti. That's it for now. Time for some vanilla greek yogurt with strawberries and blueberries, yum! Then I seriously need to clean my craft table! Love love the strawberry set!! The paper is so cool! I may have to get some!! 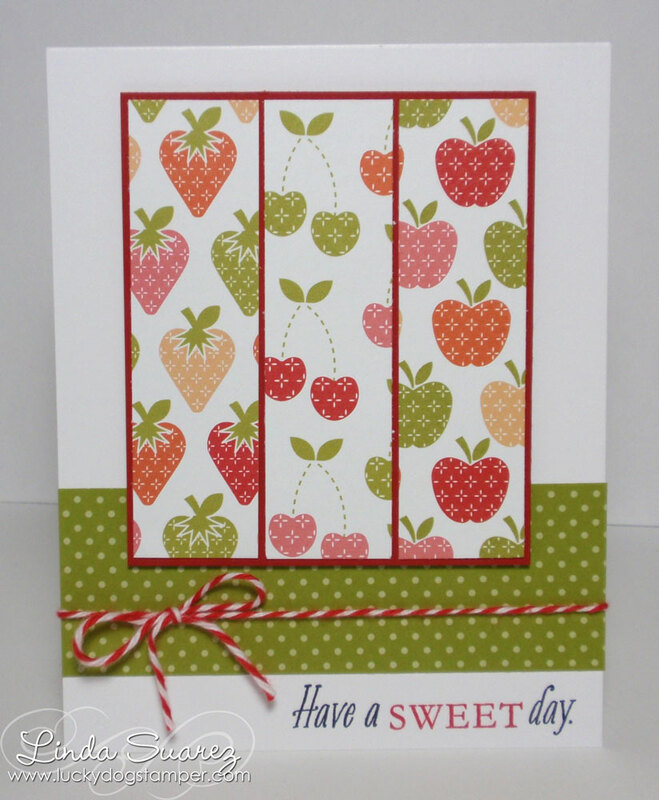 Your card is so bright and cheery Linda!! So reminds me of summer!! Great paper - love the pattern! Such a cute card! Fun card with some great colors and paper! Thanks for joining us at Freshly Made Sketches!